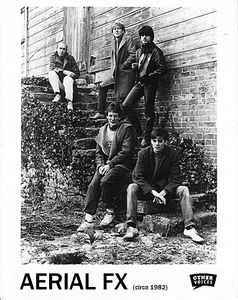 Around 1980/81 Oxford based band Exit 13 changed their sound & changed their name to Aerial FX. They signed a publishing deal with Island Music, released 2 singles ("So Hard" on Square Records & then "Take It From Here" on Island Records), & then bagged enough studio time to record "Watching The Dance" LP which was released on Kamera Records along with a single "Instant Feelings". They played shows around London & the UK throughout that period. Around 1982/83 the focus changed to studio recording & Melton & Bladon left the band. The other 3 continued writing & recording & EMI Records signed them mid 1983. Unfortunately there were creative disagreements with EMI & they didn't progress out of the studio, finally being dropped at the end of 1984. Their studio experiments continued for another couple of years but nothing was released & they stopped making music as AFX around 1986. In the year of 2010 a collection of 12 previously unreleased AFX tracks from 1980 and 1984 was released on CD by Other Voices Records.